Capex is a key concern for operators worldwide. However, one of Subex’s telecom partner has been saving millions of dollars in Capex since the past 5 years using Subex’s Network Asset Management solution. 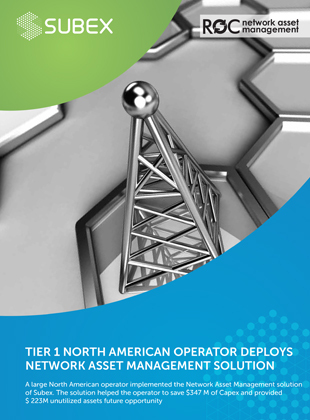 Learn how this Tier-1 North American operator has achieved ongoing Capex savings of more than $347 million, identified unutilized assets in the network which will help them to yield more than $223M, achieved 98% accuracy when identifying recoverable network assets and thus amplify their return on investment by 20 times.